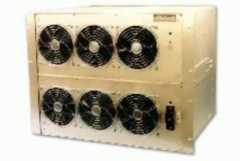 These are rugged, industrial grade 3-phase pure sine wave DC/AC inverters, 24V, 48V, 125V or 250VDC inputs available. 115VAC or 230VAC or 3000 watts. Used in solar power, telecom, commercial marine, steel mills and military applications. Fan comes on only when needed. Fully isolated, can be used in positive or negative ground applications. Phase Configuration The phases are floating and isolated from each other. This allows the power supply to be connected in a "Y" configuration or left as three individual outputs.